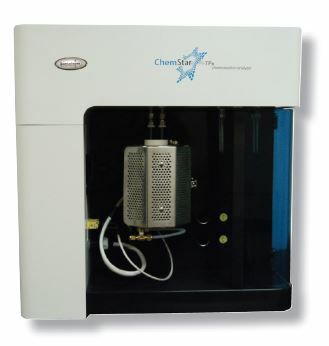 The ChemStar™ is a bench-top instrument designed for catalyst and reactive surface characterization experiments. The fully automated dynamic flow adsorption analyzer features pulse chemisorption and temperature programming capabilities. The standard features include in-situ pretreatment, automated gas mixing and blending from 10 input gas lines, and multiple programmable treatment and analysis steps. Using standard software, users can control furnace heating/cooling temperatures, gas switching and mixing, valve positions, gas flow rates, ramp rates and hold times, system alarms, detector parameters, data acquisition, and data analysis. Sample characteristics that can be measured include crystallite size, metal dispersion, active/catalyst surface area, active site strength, activation energy, acid/base site distribution, and other parameters associated with surface reactivity evaluation. The ChemStar™ is suitable for the most challenging characterization of reactive processes and chemically active materials, thanks to full automation that includes introduction of vapors and mixing of gases with high precision mass flow controllers. The ChemStar™ is also able to perform high pressure experiments to study reactivity and kinetics. Characterization of heterogeneous catalysts is one of the typical applications of the ChemStar. Quantachrome Instruments provides novel methods and high-tech models to help the development of zeolites with tailored surface chemistry and pore structure by enabling more accurate characterization of nanoporous materials with hierarchical (micro-mesomacro) pore structures. Beyond pore structure considerations, acquiring information about the surface acidity and activity of these materials, as facilitated by the ChemStar™, is an important step to optimize their performance.